I talk to so many moms who have trouble taking photos of their kids. Either the kids aren’t interested in stopping to pose for a picture, or they get impatient holding the pose as mom tries over and over to get just one good shot. I have a few tricks that just might help you get a good shot while still keeping everyone happy! 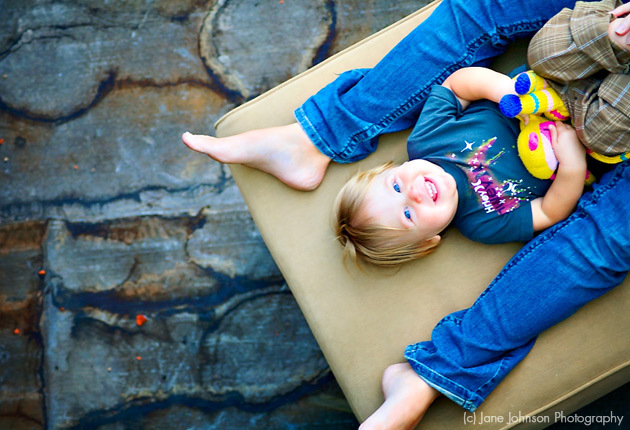 Kneel down, squat down, or lay down, but do whatever you need to in order to get on eye-level with your child. More than likely they’ll be looking down at whatever they are doing, and it’s easier to catch a glance than to have them stop what they’re doing and look up. If you have an entry level digital SLR camera, you’ll have more luck with catching the quick moments. Standard point and shoots will probably take some more finesse with the time delay. One way to get around that is to make sure you’re by a window, outdoors, or in an area with plenty of light and turn your flash off. Not only will you get better color in your photos, you also won’t have those pesky red eyes to deal with! 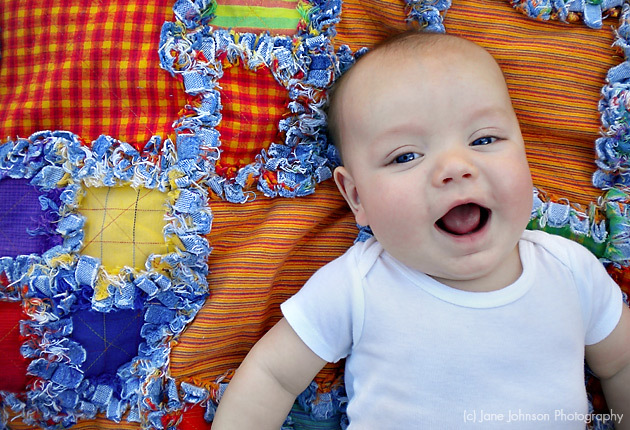 A favorite trick I use regularly with younger kids is to have them lay on their back on a blanket. Stand over them and pretend like you’re going to fall on them. If that doesn’t work (or if they’re infants that aren’t sitting up yet), kneel down and tickle them with one hand while shooting with your other. Most of the time, a fit of giggles will ensue. The above shot was taken with a Nikon Coolpix S220 (point and shoot) with the flash off, and without any color correction–just some sharpening for clarity. How many times a day is your child begging for your attention? Asking you to play with them, or pretend that they’re a dinosaur knocking on the door looking for some lunch. By now, you’ve become accustomed to tuning out the constant “mom….. mom….. mom…..” until it turns into an exasperated “MOM!” but one thing is for sure–your child loves to spend time with you! Take advantage of the opportunity, but grab your camera at the same time. Ask them questions about what they’re doing, the picture they’re coloring, the doll they’re playing with, etc. Most of the time, when they answer you, they’ll look at you. If the don’t, ask them to show you what it is they’re working on and they’ll hold it up. Set up a tea party outside. Or a picnic. Or a fort using patio furniture and blankets. Create a special environment that they don’t normally find themselves in and they’ll be having so much fun, they won’t even realize you’re taking pictures! Another trick is to play hide and seek. If they hide on the side of the house, and know you’re right around the corner looking for them, sit and wait with your camera ready. Eventually, they’ll peek around the corner to see what’s taking you so long, and you’ll be able to catch that mischievous grin that you love. A good rule of thumb from back in my film days is that you’ll typically go through an entire roll of film for one good shot. I just had a session with a 12 month old two weeks ago, and shot 255 frames to end up with 40 final images. For every good shot, there are at least six or seven bad ones. Usually, if you’re not interrupting what your child is doing (all that much) and forcing them to hold a pose and smile for twenty minutes, they won’t mind a few pictures snuck in during some quality play time. In the end, neither of you will be frustrated, and you just might happen to get that perfect shot you will still love looking at when they’re 30. Love all the tips and can’t wait to try them all with Ethan. Thank you Katie! 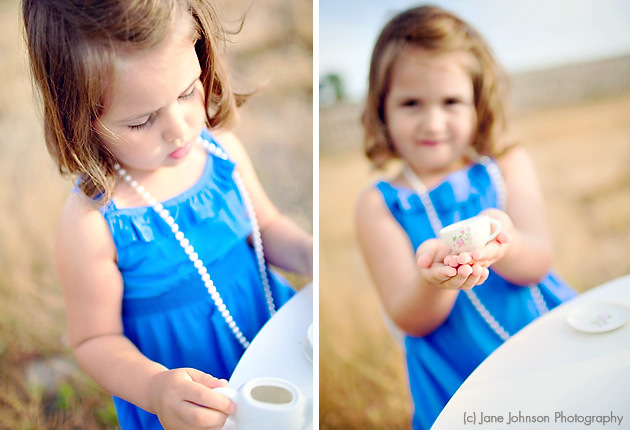 Little Ones Mini Sessions Event Suite!